Tired of winter? Feeling blah? The beauties in our newest collection of designer fabrics (many from Italy) will definitely lift your spirits. To keep you right on track with Pantone spring trends, there are colorful silks from CA designers, pretty pink-tone laces, brightly colored prints, fun knits, tropical screen-printed cotton shirtings and novelty blends. 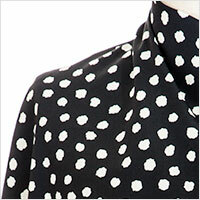 There are also some vintage inspired viscose prints, unusual black and white abstract prints, and some nifty florals. Take a look; you'll feel better.